Minister for Defence Christopher Pyne announced a new research agreement between Defence Science and Technology (DST) Group and Adelaide-based Daronmont Technologies to explore next-generation technology options for Defence applications, building on two decades of collaboration. This research and development agreement will focus on high-technology electronics and software intensive systems, significantly boosting the capability of the Australian Defence Force. Daronmont Technologies was recently awarded a $7.9 million Defence Innovation Hub contract to build a prototype radar capability to replace ageing infrastructure. "Daronmont Technologies is a highly innovative company with a strong track record of converting technology into capability for Defence. I congratulate Daronmont on this new agreement, which builds on more than 15 years of technology co-operation with Defence," Minister Pyne said. DST and Daronmont collaborated on the successful development of the Surface-wave Extended Coastal Area Radar (SECAR) that enables Defence and Australian Border Force to better monitor Australia’s northern coastline. SECAR resulted in the development of the first indigenous HF surface radar system with proven detection performance. The system has the capability to provide surveillance coverage of key areas of Australia’s northern approaches. SECAR was developed as a bistatic (separate transmit and receive sites) radar, which provides greater range for the same power as monostatic radars and eliminates ‘blind zones’. The system can be remotely operated and is capable of detecting both air and surface targets simultaneously. This new research agreement will partly support the Defence Innovation Hub contract and information integration technologies. 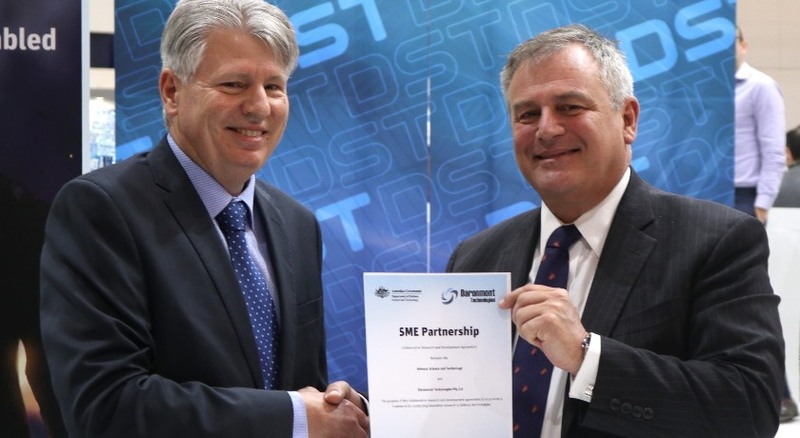 The research agreement was signed by Chief Defence Scientist Dr Alex Zelinsky and Ben Norris, CEO of Daronmont Technologies, at the recent Land Forces event. When announcing the collaboration agreement at Land Forces 2018, CEO Ben Norris said, "I am excited to continue the long standing partnership with DST exploring where this agreement will lead into the future. Daronmont Technologies is a proven system integrator with a pedigree in signal processing and RF engineering." Daronmont Technologies is a wholly Australian owned defence industry SME specialising in design, engineering, integration and support of complex high technology electronics and software-intensive systems.